"In the Spring of 1651, founding father Richard Bellingham of Massachusetts gave staid Puritans a terrible shock, by marrying a woman half his own age and performing the ceremony himself. Bellingham, who had just been elected as Governor of the colony, was about 50. His bride Penelope Pelham, niece of Lord de la Warr, for whom the state of Delaware is named, was only 21 or 22. She was Bellingham's second wife. That the Governor should marry again at age 50 was only to be expected. In Puritan days widowers commonly went a-courting, and widows set their caps within a few months of the death of their former spouses. 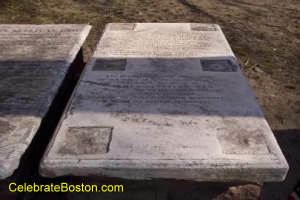 Governor John Winthrop was three times a widower, but never for long. And because Penelope's own grandfather, Herbert Pelham, had married a second time, her aunt was also her step-grandmother. But in Bellingham's case there were, in addition to the novelty of self-marriage and the youth of his bride, circumstances that made the good citizens of Boston put their heads together and talk. Penelope had been as good as engaged to another man—a man of nearly her own age, and a very close friend of Bellingham's. Though the records do not give us his name, we know that he resided in Bellingham's house. And in the course of this other man's wooing, Bellingham saw a great deal of the youthful Penelope, and became intensely interested in her. Just about the time that the neighbors expected to hear of the formal betrothal of Penelope to her young lover the Governor himself stepped in, wooed the maid and won her. Then, instead of making a public announcement of his intention to wed, as the law required, he speedily finished the job by tying the conjugal knot with his own hand. For failure to publish the nuptial the Governor was prosecuted. But, being Governor, and, adding to his novel marriage ceremony the further novelty of insisting he sit as a judge at his own trial, the proceedings came to naught. The Governor's self-marriage probably was legal enough, for he had authority to perform marriages. Civil officials did all the marrying in Puritan Massachusetts. Ministers were barred; for anything in the nature of a religious ceremony was frowned upon as one of the hated practices of the Catholic and Episcopal churches.